Need big axe power in a smaller, tomahawk axe size? Without breaking the bank? Then this Executioner style tomahawk is the perfect fit! 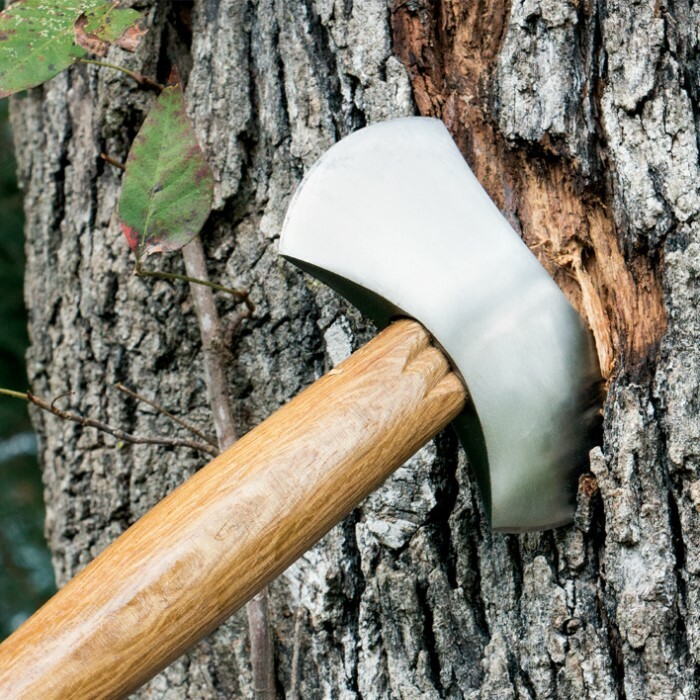 The axe head is constructed using a solid block of stainless steel, mounted atop a finished hardwood handle and balanced. Handy to store and carry, it measures 14 in. overall with a 5 in. head. Includes leather belt sheath. I'm in my mid fifties. I've been throwing knives hawks and axes since I was twelve. I've broken handles due to bad throws and incorrect rotation and force. 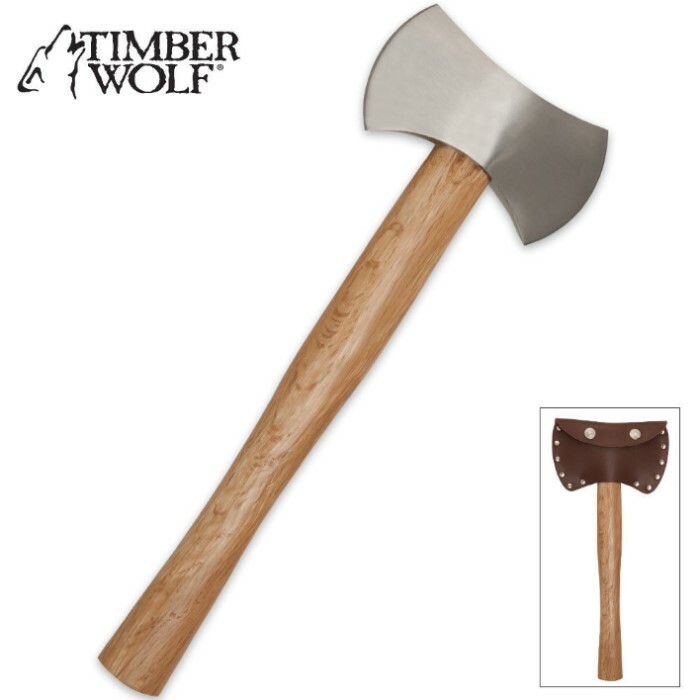 I'm getting this as a tool and a thrower, I've read the reviews and if it breaks I'll put an ash wood handle on it and throw it some more, like my full sized double headed timber axe. Great little axe, just the right size for camping and with two faces I can do more without having to resharpen so often. For those people who want a throwing axe, this is not for you. 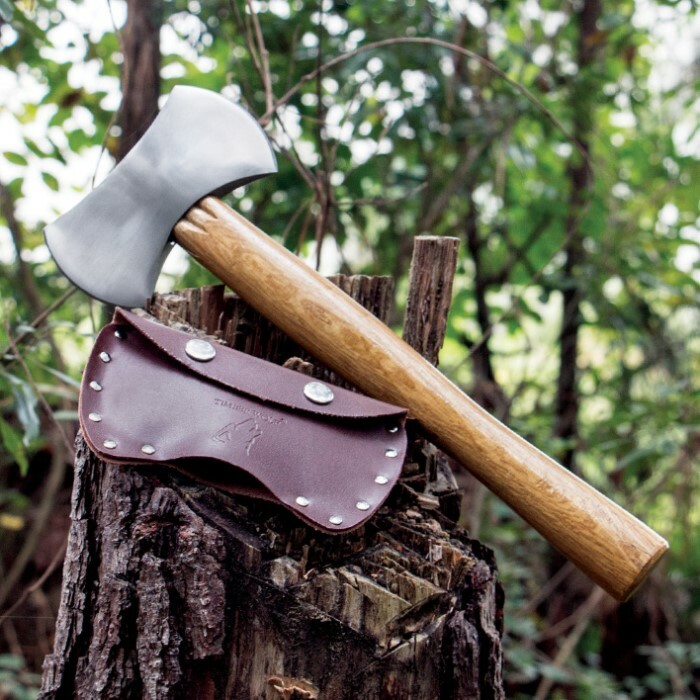 This is a great axe for camping or a 72hour bag. I read a lot of these reviews of people who say these products break within minutes of use or are not worth the money. If these items are used properly by someone who knows how to use them, dose so in the proper way and takes care of the equipment they will last. If the items are abused and are not used in the proper fission they will, easily and quickly, become damaged; this is the case with those who have poor reviews of the Timber Wolf Battle Axe. I have used mine camping, to cut small amounts of wood for my fire. Afterwards I clean off the blade, sharpen if needed, spray a protectorate on it, and put it away in its proper location. If you do this the Timber Wolf Battle Axe will last you for years. I know the description says that it was designed for throwing, but this should only be done by those who know what they are doing and with the proper equipment. I do not recommend attempting to imitate the people in the demonstrations on this sight as, it is clear, they donâ€™t know the proper use for these items. I recommend this item to those who know how to use it in the proper way. Itâ€™s a good buy and well worth the money. so small a mouse could use it only reason i dont score it less is that it is a good blade despite its size. Axe head kinda small to be truly useful handle broke within a week not impressed at at all.